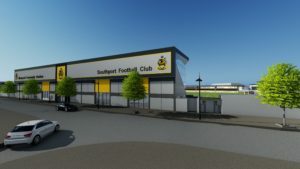 Southport FC last night revealed their plans to revamp the Merseyrail Community Arena, with a new stand on the horizon and hopes of broadening their fan base. Since the appointment of their first ever CEO, Natalie Atkinson, Southport FC have created a vision for where they want the club to go and targets to reach. In recent years, some local supporters have drifted away and match-day attendances have dropped, but Ms Atkinson is hopeful of attracting them back and winning new followers. The idea is to re-identify themselves and create a new image for Southport FC, but the development that has earned the most attention is the plan to improve their Haig Avenue stadium. By the beginning of next season, The Sandgrounders aim to completely refurbish the main stand and add another one opposite to accommodate additional numbers. Atkinson feels like now is the right time for Southport, saying: “We are aspiring to be back in the Football League and achieve the status of being the focal football club of the town. “From the achievement of this vision, we also aspire to build state-of-the-art facilities whereby our teams, fans, supporters and community have an unforgettable experience and continue to support the football club. Plans for the stadium refurbishment have been submitted by the National League North to Sefton Council.